A journey with out a destination! As time goes on I have developed and changed, have seen and experienced a lot. I am now content and can accept what has happened to me? Can I be proud of the results of my daily routine and determination? 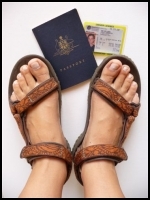 For 2 ½ years I am a migrant in Australia with the constant willingness to have my baggage ready for one more time to travel to my roots. A never ending journey! In October - November 2008, I with a large red 35 kg suitcase, 3 backpacks and 2 small children (4 and 5 years) went for a vacation in Europe with the thoughts to resettle in Europe. Once back in Australia I am surprised with my personal discoveries. Is this the country where I can breathe freely? Is this the place where I can fly free with the wind? Is this the dream of my dreams to be a poet and free to create my art? For the first time in my life I have realised that I have no home where I belong. My new goals are to integrate, to fit in the new environment, and to feel happy with my new Australian way of life. Yes I have succeeded! I have successfully completed 3 tests and I feel as equal as any other Australian. I am loyal to my culture, feelings, interests and sensors. I have overcome a difficult process without pushing and putting myself under pressure which has made me stronger than I was. Today I am proud with what I can overcome and who I am!